On a recent Hilton Head Island broker tour I was able to tour an available Oldfield Plantation home. What makes this home special is the traditional look on the exterior and the contemporary style on the interior. With features suited for all ages and families, this home was designed for inter-generational living. The main house offers 3 bedrooms and a mother in law suite with a third living section over the garage. Before we chat about this awesome home, here is a review of the features and amenities of the Old Field Plantation community. This Oldfield Plantation home is priced at $1,399,000. Listed by an agent in my firm, this home offers many unique features that would be hard to pass up. Just look at these views! For more information about this unique property on the Okatie River or to view other homes for sale in Oldfield Plantation, please contact me today. 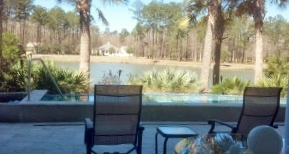 Visit www.hiltonheadrealestate.com for the latest Hilton Head Island area real estate news and market updates. *If you happen to read this post and the links above show the home unavailable, it’s because these properties have gone under contract. Feel free to leave a comment below and tell us which features in this stunning Old Field Plantation home pique your interest.